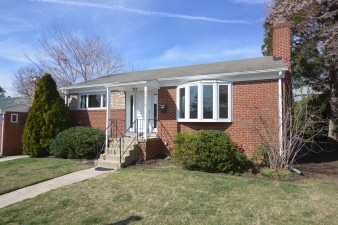 Classic all brick rambler in wonderful Garrett Park Estates with finished basement! Approximately half a mile to the Grosvenor-Strathmore Metro. Filled with light, this charming home boasts an inviting living room with brick fireplace, recessed lighting and bay window. Freshly painted kitchen with large pantry and access to back deck. Separate dining room with chandelier. The main level is complete with two bedrooms, a renovated full bathroom, two coat closets and linen closet. The large updated lower level features a generous family room / game room with recessed lighting, wall to wall carpeting, and built-in shelving. There is a nice sized bedroom on the lower level with a generous closet, an updated full bathroom, laundry / storage room, additional storage under the stairs and an exterior rear entrance. Fantastic fenced backyard with lots of space to run about. The backyard features a nice deck off the kitchen and an expansive flagstone patio – ideal for entertaining! The perfect location, conveniently located just blocks to Strathmore-Grosvenor Metro, the Marc train, Rock Creek Park, Strathmore Concert Hall, White Flint Park, Garrett Park Elementary School, and the new North Bethesda Shops.